"Sofia is interested in testing a hydrogen bus in public transport and we are talking about it," said the mayor of Sofia, Yordanka Fandakova, at the opening of the Hydrogen Summit in Sofia, Bulgaria on 28 May 2018. The Hydrogen Summit was organised by the Fuel Cells and Hydrogen Joint Undertaking (FCH JU) during the Bulgarian Presidency of the Council of the EU and marked the 10th anniversary of the FCH JU. The Hydrogen Summit was attended by a number of Bulgarian politicians, including MEP Peter Kouroumbashev, Minister of Education Krasimir Valchev, and Deputy Transport Minister Anguel Popov, who said that hydrogen-fueled vehicles represented the future of cars. Currently there are no charging stations for hydrogen cars in Bulgaria. The goal is to build ten charging stations by 2025, said Popov. Hydrogen fuel cell electric vehicles were available to test drive in front of the National Palace of Culture during side events supported by the Ministry of Transport, Information Technology and Communications, the Ministry of Education and Science, the Bulgarian Academy of Sciences and the Sofia Municipality, amongst others. "The technology is clean, as the only waste product from this engine is water. It's a good environmental choice, especially in light of the fact that every year in Europe, there are over 500,000 premature deaths due to air pollution,” said Bart Biebuyck, Executive Director at the FCH JU. Two of the four fuel cell electric vehicles showcased during the ‘Hydrogen Days’ side events were the result of the work of students from the Technical University in Sofia and Rousse University. A hydrogen charging station was also demonstrated, and staff from the Technocrati Educational Centre involved children and adults in onsite experiments to share a glimpse of the exciting future that renewable energy offers. “I strongly encourage more Bulgarian scientists to consider project funding from organisations such as the European Commission's Fuel Cells and Hydrogen Joint Undertaking, and to be much more active in applying for funding for research and projects,” said MEP Peter Kouroumbashev. "There are already 50 hydrogen buses in Europe now. Fuel cells can be powered by hydrogen, which is produced from 100% renewable sources, such as wind or solar power,” added Kouroumbashev. As well as the family day on 27 May and the Hydrogen Summit on 28 May in Sofia, two additional events took place in Budapest (Hungary) and Timisoara (Romania). Supported by local hydrogen associations and policy makers, these events sparked a lot of interest among the participants as well as the general public. The FCH JU’s two hydrogen fuel cell cars were on display and available to test drive. In Budapest, István Lepsényi, state secretary from the Ministry for National Economy and László Palkovics, state secretary from the Ministry of Human Capacities met with Bart Biebuyck to discuss the current situation and future plans for FCH technologies in Hungary. Timisoara Mayor’s office welcomed the FCH JU’s second event in Central and Eastern Europe (CEE). Representatives of the FCH JU were pleased to meet Mayor Nicolae Robu and introduce the Joint Undertaking’s work. Two Members of the European Parliament took the opportunity to test-drive the fuel cell cars, gaining a new appreciation of the many advantages of fuel cell technologies. 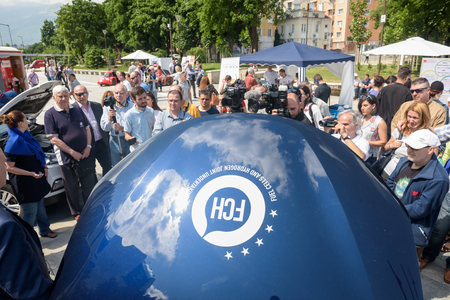 The events organised by FCH JU in the CEE met with many positive reactions both from the policy makers and public, generating a new awareness of, and enthusiasm for, fuel cell and hydrogen technologies and the work of the FCH JU. The events were also widely reported in the Bulgarian media, and highlighted the opportunities for all levels of governance, industry, research institutes and academia to work together for a clean energy future in Europe.